Tyree Daye is a poet from Youngsville, North Carolina. He is winner of the 2017 APR/Honickman First Book Prize for his book River Hymns. 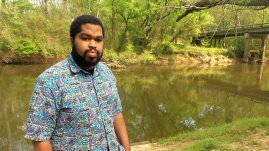 Daye is a Cave Canem fellow and longtime member of the editorial staff at Raleigh Review. Daye’s work has been published in Prairie Schooner, Nashville Review, and has poems in Four Way Review and forthcoming in Ploughshares. Daye recently won the Amy Clampitt Residency for 2018 and The Glenna Luschei Prairie Schooner Award for his poems in the Fall 2015 issue.